One of the things that I most look forward to when the weather starts to warm up is switching out my makeup. And, lucky for me it’s coming at the perfect time this year! 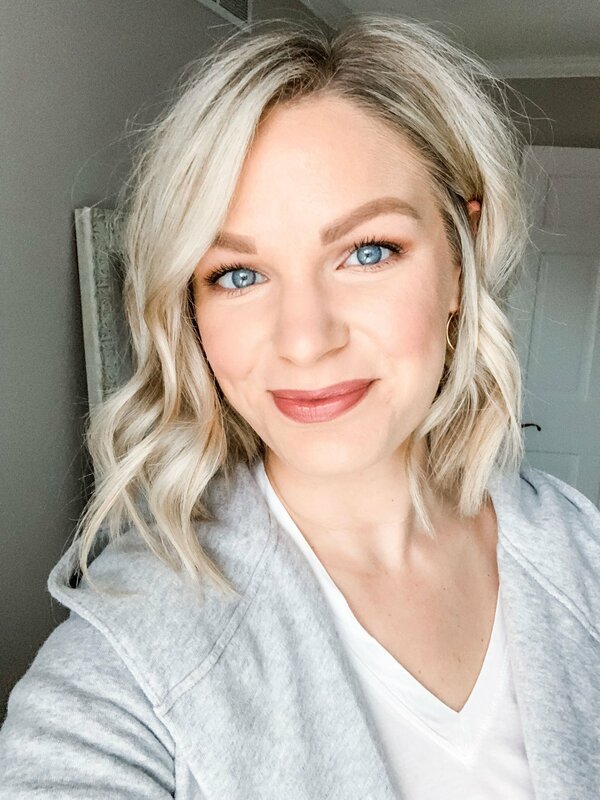 I’ve been in a bit of a beauty rut, so I’ve been strategically trashing, swapping and buying new products the last couple months for a fresh look. I’m also striving toward a cruelty-free beauty collection – more on that in the future! – so it has been fun to discover some new-to-me brands and products. 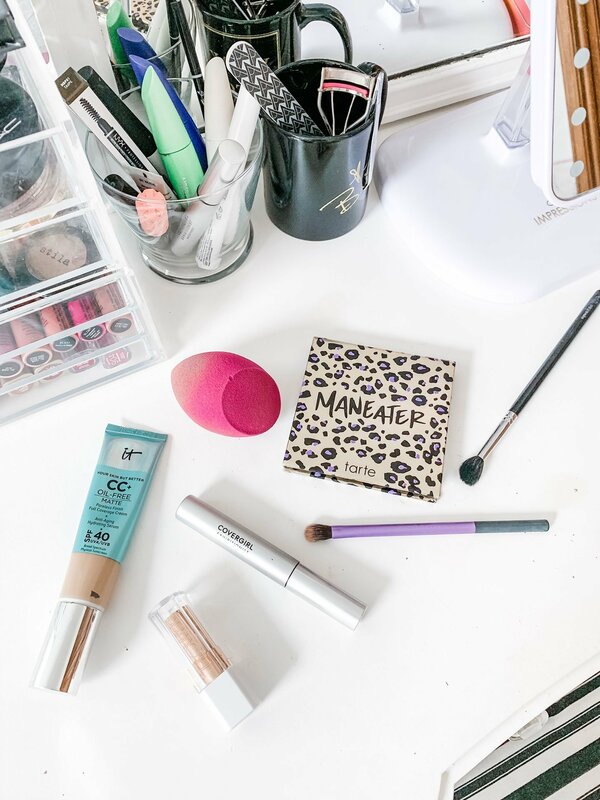 So on that note, here’s what’s new in my beauty bag for spring! + e.l.f. Total Face Sponge. The good ‘ol days when I was a brand-name makeup sponge snob really make me laugh. Probably because now there’s no reason to splurge! 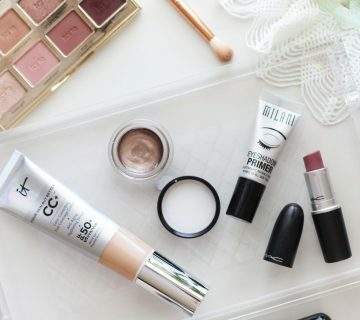 There are so many great drugstore options. This is probably the closest dupe I’ve found for it’s high-end counterpart, and $5 is one of the cheapest options available. + itCosmetics Oil-Free Matte CC+ Cream. 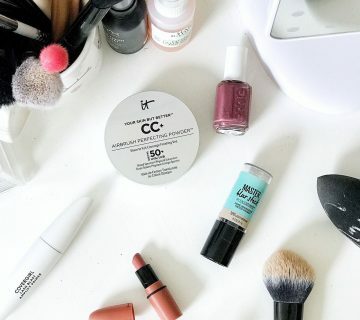 Discovering the original CC+ cream last summer was life-changing for my skin and makeup routine. Unfortunately, my skin is going through another weird transition so the original isn’t applying/lasting as well as it once did. But, I find the matte formula to be a little much … so, the answer? Mix the two! One pump of each formula then mixed together still gives my skin that full, but healthy coverage with way better lasting power. + Tarte Maneater Eyeshadow Palette V2. Funny story about this product – I actually bought it sometime last year, but I ultimately returned it because I couldn’t justify another eye shadow palette. Well, thanks to an abundance of gift cards, store credits, member points and a coveted Ulta 20% off everything coupon, this palette is back in my possession. AND, I’M LOVING IT. The size, the shade selection, the formula – everything is spot on with what I look for in a palette. The shadows definitely lean more toward warmer tones so I’d skip this if that’s not your thing. This might very well be the only palette I pack for vacation next week, and I’m a-okay with that since this has everything I need. + CoverGirl Exhibitionist Mascara. CG rarely fails me in the mascara department – their Clump Crusher formula is one that I always go back to – so I’m not surprised that their newer release is doing it for me. Initial application on it’s own (plus a primer) gives more length than volume, but I find the formula pretty buildable. Two to three coats usually gets me the more volumized look that I prefer. No issues with flaking or smearing throughout the day either. I also can report back that the waterproof version actually works, but it isn’t too difficult to wash off. Can we also appreciate the simple, sleek packaging? + Flower Beauty Petal Pout Lipsticks. Briefly mentioned this lipstick in my March favorites, but I wanted to talk a little more about it. People, Drew Barrymore knows what she’s doing with makeup! I’m so blown away by this formula. Even the mattes are ridiculously hydrating on the lips, and the staying power is insane. The two shades I currently have are Spiced Petal – my go-to for everyday! – and Naked Blush. I can’t wait to pick up more and explore other products in this line. As always, here’s all the products in action compliments of my iPhone! I also have a couple products on my radar, including the Physician’s Formula Rosé All Stay Illuminating Setting Spray and Milani Illuminating Face Powder. Both come as recommendations from my go-to beauty guru Cara – seriously, go check out her latest post to see the setting spray in action. Hello, beautiful glowy skin! 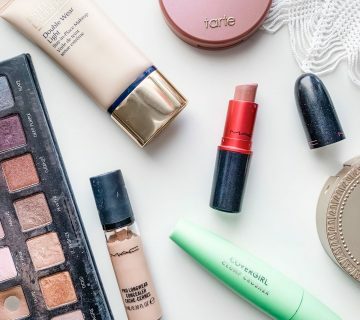 Do you transition your makeup from winter to spring/summer? 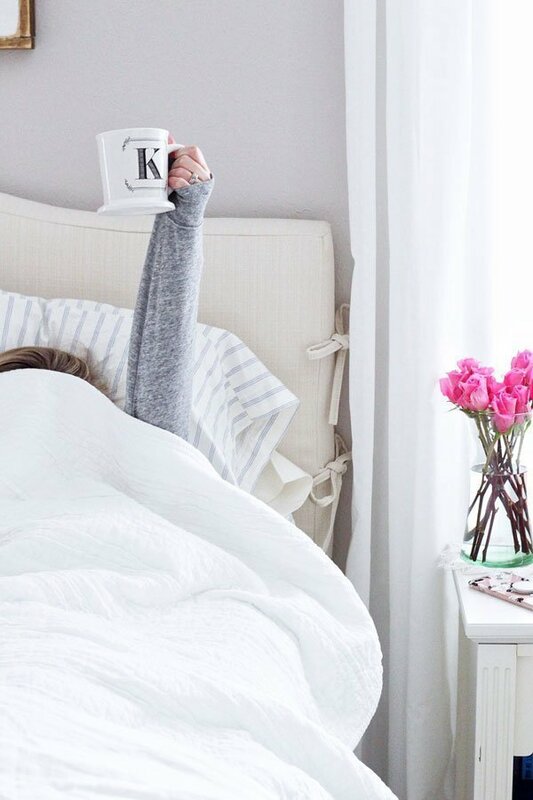 What new products are on your radar? I should try the E.l.f. Total Face Sponge, I currently use the one from Real Technique, but would be great to have a new one! Flower Beauty Petal Pout Lipsticks look awesome – love the colors and if you say they really last, that´s perfect!!! The RT sponge is one of my favorites, too but the E.L.F. one is just so good! I highly recommend it, as well as the Flower lipsticks! 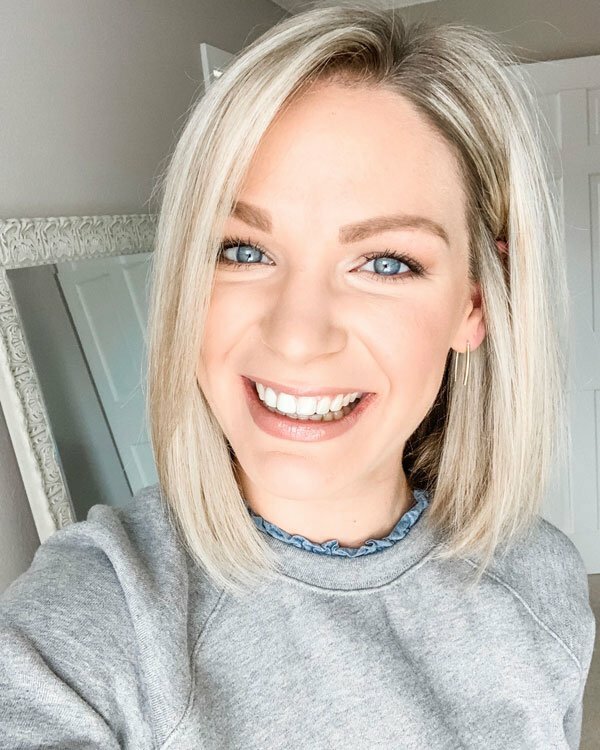 Your makeup is always stunning! I have a couple of the FLOWER lip butter sticks, and I really like them! Love that Drew Barrymore is behind this brand, love her! Just bought a Milani blush for the first time and it is really nice too! Both great brands with great products! That palette is so pretty!! I bought the Tarte Flirt palette and I have been using it almost every day. I love it and it smells SO good!! A cross between chocolate and a baked good haha. 🙂 Thank you for sharing and have a great day! Tarte products do smell so good, I agree! Same! Both are just so good.